1. p-Cymene is an aromatic monoterpene found in the leaves of Eucalyptus spp. and is ingested in the diet of two marsupial folivores, the brushtail possum (Trichosurus vulpecula) and koala (Phascolarctos cinereus). The metabolism of p-cymene by liver microsomes from the possum, koala and rat (an animal whose diet is not terpene-rich) was examined. 2. The major p-cymene metabolite in each species was cuminyl alcohol, with smaller amounts of other side-chain alcohols being formed. No phenolic metabolites were detected. Possum and koala microsomes further oxidized cuminyl alcohol to cumic acid. 3. Pretreatment with a terpene diet more than doubled the Vmax for cuminyl alcohol formation by possum microsomes. This is similar to a previous finding by our group with 1,8-cineole and indicates that a terpene-containing diet results in induction of the enzymes responsible for terpene metabolism. 4. 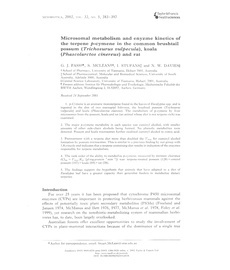 The rank order of the ability to metabolize p-cymene, measured by intrinsic clearance (Clint = Vmax/Km [µl mg protein−1 min−1]) was: terpene-treated possum (128)>control possum (107)>koala (69)>rat (38). 5. The findings support the hypothesis that animals that have adapted to a diet of Eucalypus leaf have a greater capacity than generalist feeders to metabolize dietary terpenes.